"Everyone has talent at twenty-five; the difficulty is to have it at fifty." An artist who’s history is a bit confused by the general public is the Realistic master, Edgar Degas. His work was created on the border of Romantic Realism and Impressionism, however, created art in the way of the Realists. Beyond is own preference in being called a Realist, he would often draw, he created his art in a studio from drawn sketches, he refused to paint outside, he did not focus his attention on light and color, and he pained over the compositional makeup of his paintings. Traits of his working are opposite of what it was to be an Impressionist. "No art has as little spontaneity as mine. What I do is the result of much thought and careful study of the old masters." Degas was born in Paris, the son of a wealthy banker. He intended to go into law, but in 1855 chose to become an artist. A couple of years before, he had dabbled with painting in his in-home studio without any instruction. He would go on to study at the Ecole des Beaux-Arts under Louis Lamothe, a pupil of Jean-Auguste-Dominique Ingres. Ingres was and is a painting icon and major influence on Degas‘ work. He also did some independent studying in Italy. He would go on to considered one of the great masters of composition although he was largely self-taught. Independently he worked to master the concepts of the classic artists and filled many sketchbooks with these lessons leaned. Degas’ study helped him to get several works into the official Salon before joining up with the Impressionists. Like Édouard Manet, although he was not truly an Impressionist in style and approach, he was great friends with many impressionist painters. His most notable friendship was with Impressionist female painter, Mary Cassatt. Unlike Manet, Degas also displayed his art with the Impressionists. After spending a year in New Orleans, Louisiana, he began regularly showing with the Impressionists. He was in the official Impressionist show from 1874 through 1886. Degas loved to paint, as other Realist artists did, scenes and people from everyday life. Being a member of the high society, he preferred to paint ballet dancers, horse races, and other activities done in typical mid-1800’s high society. During the Franco-Prussian War he took time off his work to join the French National Guard’s artillery division. After his time in the military, for some unknown reason, he had problems with his eyes. 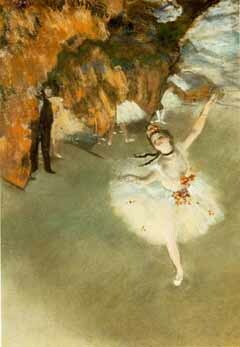 In one of his great works, The Star, Degas shows a ballerina from a high vantage point. Having the subject off to the side with a largely flat background is a Japanese print influence. He has an interest in how we see and use line in a composition. His compositions look unorganized but are totally thought through. 1878. Pastel on paper. 23 5/8 x 17 3/8 inches. Musée d'Orsay, Paris, France. Skilled in many media, Degas worked in oil paint, printmaking, pencil, chalk, watercolor, pastel, and would even sculpt with clay and wax. Pastel drawing became an important media for him in 1869. He used a combination of hatching and vertical strokes in this media. One example of his abilities in pastel drawing is his work Singer with a Glove. This work combines his compositional abilities and drawing techniques with his distinctive subject matter. 1878. Pastel and liquid medium on canvas. 20 3/4 x 16 inches. Fogg Art Museum, Cambridge, Ma. USA. As Degas’ eyesight faded, so did his association with the rest of society. By 1967 he was working several projects in sculptural medias. He said, "It is for my own satisfaction that I shaped beasts and people out of wax, not to have rest from painting and drawing, but to give my paintings and drawings more expression, more ardor, and life," however there were other motivations. Like so many other artists before him, he felt that loosing his sense of sight was a sign of weakness and discredited his ability to create. So he covered up his disability. By 1881, there was considerable loss of vision. This forced his work to shift even more to the sculptural medias. He had made almost 150 sculptures that were made of translucent beeswax, clay, plaster, and plastiline. After his death seventy-four of those were restored and cast in bronze. Twenty-five copies were made of each model. This work was created over a span of almost forty years at the time of his death. There are other "lost" or "rediscovered" sets of sculptures. Experts of Degas work largely feel that these are not what they are promoted to be and are therefore not included in on this site. Many authentic examples of this work is in our National Gallery of Art and at the Musée d'Orsay in Paris, France. The only sculpture that Degas had a direct part in the casting and displayed during his lifetime was Little Dancer of Fourteen Years, which was placed in the sixth Impressionist Exhibition in 1881. Technical studies, including three-dimensional computer modeling, spectroscopic, chromatographic, microscopic analyses, laser scans, and radiography, have concluded that the bronze cast was created by a plaster located at the Joslyn Art Museum in Omaha, Nebraska. Inside this plaster model is human hair coated with wax, actual ballet shoes, with a core armature created from lead piping, wood, paint brushes, wire, padding, rope, clay, and wax. Interestingly enough, she also has another head inside her head. He was planning on unveiling the work at the 1880 Impressionist Exhibition but at the last moment pulled the work out to rework the head. Thus, the work has its debut in 1881. The wax figure had a cloth costume with a gauze five-layer tutu and ribbon in her hair. In 1922, she was made into a plaster mold and then cast into bronze. One of the ten copies sold in 2009 for 19.2 million dollars. 1876-1881. Bornze, Muslin Skirt, Satin Ribbon. 38.5 X 13.8 X 9.6 in. Musée d'Orsay, Paris, France. Although productive, he was ashamed of his vision disability and spent the last twenty years of his life in solitude. His last art show during his lifetime, and the major cause for his being considered an Impressionist, was at the Impressionist show of 1886. He made his last work in 1908. He lived in Paris and wandered the streets. At the time of Degas death, he left more than 2000 oil paintings and drawings as well as 150 sculptures. Today, a Degas painting can sell for well over sixteen-million dollars a piece.